SharePoint has supported localization in each of its version to help build better content for users worldwide. SharePoint Framework is also not an exception to it. SPFx offers multilingual support with the help of localized resource files as a part of SPFx solution. In this article, we will explore localization options with SPFx. SharePoint has supported localization in each of its versions to help build better content for users worldwide. SharePoint Framework is also not an exception to it. SPFx offers multilingual support with the help of localized resource files as a part of an SPFx solution. In this article, we will explore the localization options with SPFx. We will use ReactJS to develop the example. Hit Enter to have a default name (spfx-react- localization in this case) or type in any other name for your solution. Selected choice - Hit Enter. Here, we can select the target environment where we are planning to deploy the client web part, i.e., SharePoint Online or SharePoint OnPremise (SharePoint 2016 onwards). We can choose to create a client-side web part or an extension. Choose the webpart option. SPFx solution holds localized texts in "loc" folder. The "mystrings.d.ts" file declares an interface for strings. By default, the en-us.js file has localized texts in English. The default locale used by the SharePoint Framework is en-US. To support localization for any language, we need to add js file for each supported language. Add file fi-fi.js under “\src\webparts\localizeText\loc\” with localization for Finnish language. The content inside the web part can be localized in the same way as of web part property pane. For each of the strings to be localized, add a key to the localization TypeScript definition file and localized values in each of the locale JS files. We will localize the button text of the web part. Add a key for the button text. Open \src\webparts\localizeText\components\LocalizeText.tsx and add reference to the localized strings. Replace the actual content with the references to localized strings. 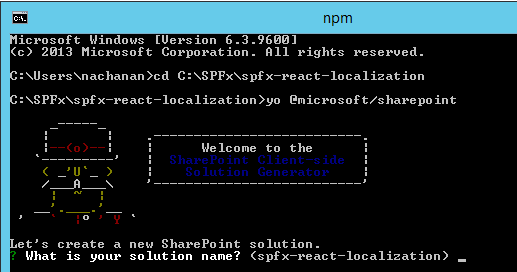 The locale value of spPageContextInfo.currentUICultureName is being used as default locale. On SharePoint local workbench, the default locale used is en-US.